Fantasia 2016 Review: Too Young To Die! Nana Seino, Tomoya Nagase, Ryunosuke Kamiki and Kenta Kiritani play musicians in the Japanese film Too Young To Die! which was shown at the Fantasia International Film Festival in Montreal. Too Young To Die! is full of laughs, music, demons, and love. It’s educational, too! I saw this raucous crowd pleaser in the very best circumstances possible, with hundreds of other enthusiastic film fans at the Fantasia International Film Festival, right here in Montreal. Daisuke (Ryunosuke Kamiki) and his fellow high-school students are riding a bus home after a field trip. Earlier, Daisuke had bribed a friend to change seats with him so he could sit next to his crush, Hiromi (Aoi Morikawa). They are having a shy chat when the bus goes over a cliff. Daisuke wakes up in Buddhist Hell wondering what he did to end up there and how he could be so much worse than his fellow classmates. None of them are there with him, even though initial reports say that all the students on the bus died, except one. Daisuke tells Killer K (Tomoya Nagase) a long-haired, horned, fanged guitar-playing demon, that he wants to go wherever Hiromi is. (He hopes she’s alive but he assumes that she’s in Heaven.) When Killer K says that no one has ever gone from Hell to Heaven before, Daisuke vows to do his best to be the first person to do that. In the film To Young To Die, Daisuke (Ryunosuke Kamiki) works really hard in Hell; he’ll do anything for another chance to see his true love Hiromi. There will be many challenges ahead! 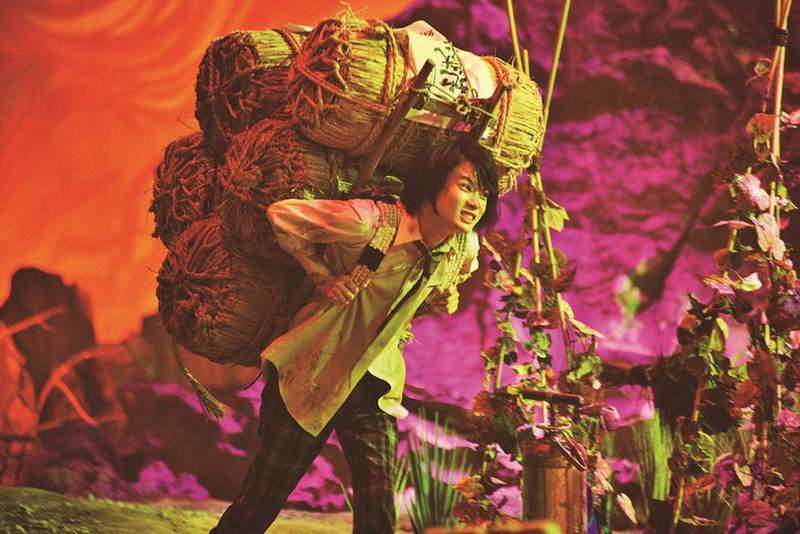 Daisuke has to haul heavy loads AND attend Hell Agricultural High School, too! He’ll have to work very hard in Hell to be re-incarnated on Earth. What kind of creature he will be depends on his own efforts and the whims of Lord Enma, who sits in judgement. I’d be going into serious spoiler territory if I mentioned ALL of his reincarnations, though they include a bird, performing sea lion, a dog, and a giant scorpion. It’s pretty hilarious to watch Daisuke, who returns to his family home as a pale blue parakeet, frantically trying to delete a naughty video from his smartphone, and send one last text message to Hiromi. Daisuke will get seven chances to redeem himself, but if he fails, he will turn into a demon like Killer K. Already his face is getting a bit redder, his teeth are longer and sharper and he can feel little bumps on his head where his future horns might sprout. Arata Furuta plays Lord Enma in Too Young To Die! Lord Enma sends Daisuke back to Earth as a bird, a dog, and a sea lion, among other things. Joining Hiromi is Daisuke’s main concern, but there’s a secondary plot line about a demonic battle of the bands. Killer K wants to recruit Daisuke for his group, Heruzu (Hells). This plot provides several tunes, some outrageous gags and an ultimate pyrotechnical showdown. Despite the abundance of laughs and silly situations, Too Young to Die! is also a genuine love story. Years go by, but Daisuke’s love for Hiromi never wavers. I found it very touching. Writer and director Kankuro Kudo is obviously taking lots of liberties with his depiction of the Buddhist underworld, but he didn’t make it all up, either. Just Google Lord Enma and Ox-Face and Horse-Head for some background, and you’ll see. That’s why Too Young to Die! is also educational. Musical Notes: Tomoya Nagase, who plays Killer K, is a musician in a band called Tokio. Director Kudo plays guitar in a band called Group Tamashii. Ryunosuke Kamiki, Tomoya Nagase, Kenta Kiritani and Nana Seino played the film’s title track at the Tokyo Metropolitan Rock Festival in May. If you like the songs in the film and you’ve got money to spare, you can order the film’s sound track from CD Japan. Interesting coincidence: Before the bus crash, Daisuke bought Hiromi an amulet at a temple. A few days after watching the film, I saw a guy on the metro with a similar amulet hanging off his knapsack. I would have liked to ask him about it, but I didn’t get the chance before I had to get off the train to watch another Fantasia film.